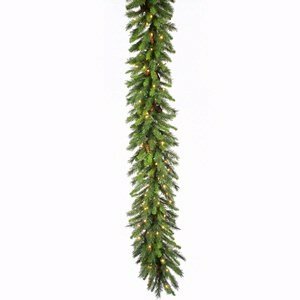 50-Feet x 14-Inch Cheyenne Pine Garland 350 Dura-Lit Clear Lights, 1320 PVC tips, Cones. 1320 PVC Tips. Dura-lit Lights utilizes microchips in each socket so bulbs stay lit even when some bulbs are broken or missing. 1 Year Limited Manufacturer warranty. Made in China. Item Weight is 10-Pounds.